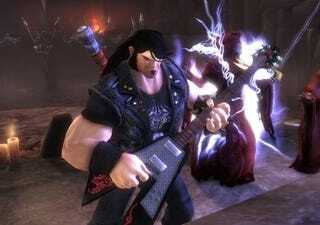 It figures that, when the Brütal Legend soundtrack was revealed, it would come out of a place like Denmark. They take their metal seriously, and EA Denmark has the list of more than 100 songs in the game. Here is the list, according to the page (translated to English), which I screenshot just in case it gets taken down. It's consistent with this leak of about 10 songs on the soundtrack. The announcement is not dated, and does not appear to be linked from the main ea.dk site. Dokken, Megadeth, Metal Church, Judas Priest, Ratt and - holy god Whitesnake. I'm 14 and watching Headbanger's Ball on MTV all over again. Tipster Greg the Allegedman points out the game's obvious lack of Iron Maiden, though. I've emailed EA's PR contact for Brütal Legend to ask what gives here. If they say anything, we'll update.